There’s nothing like having an extended Easter weekend to fill with paddling. 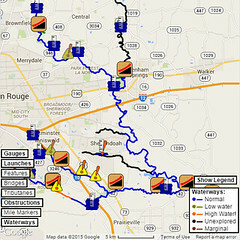 From University Lake with The Backpacker’s Demo Day to Bayou Fountain on a PaddleBR trip, much fun was had. Saturday morning, we headed out to University Lake where The Backpacker was having the April demo day. (Their next scheduled demo day is May 20th.) We always enjoy hanging out with them and sharing PaddleBR with all the new and prospective paddlers that come by, and Saturday certainly did not disappoint. The weather was excellent, and lots of people dropped by to try out the various boats. I tried out the new Hobie reversing drive since I have pedal drive kayaks for my offshore camping trips — our bayous often have too many logs or too shallow water. If I were into fishing, I’d be really tempted. 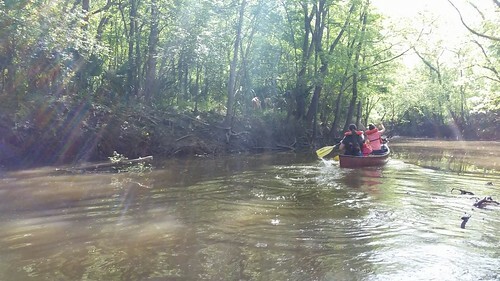 If you have a slick new boat or just want to ride along in our boats on a paddle trail maintenance day, fun paddle, or adventure, anything that gets people out there enjoying the water is great in out books. There were a few sprinkles during the demo day, and eventually some thunder in the area wrapped it up. Compared to a paddle trail maintenance run, it just didn’t seem like enough to fill a day, so I made a quick side trip to check out the Bayou Fountain paddle launch. Several kayakers were there, and I got to talk to a few people who just dropped by to see the launch. It seems news is certainly spreading about the new launch, as I’ve yet to stop by without talking to at least a few interested paddlers. 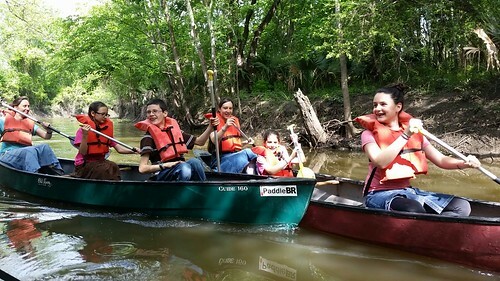 And speaking of interested paddlers, ever since we started working on Bayou Fountain, my nieces and nephews have been interested in a trip on the bayou. 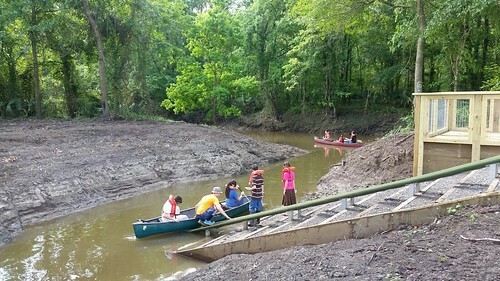 We’d had a few paddle days at the lake at Greenwood Park, and they’d paddled a canoe or two around their pond (and into the house during the flood), so they were good to go now that the Bayou Fountain paddle launch is ready. 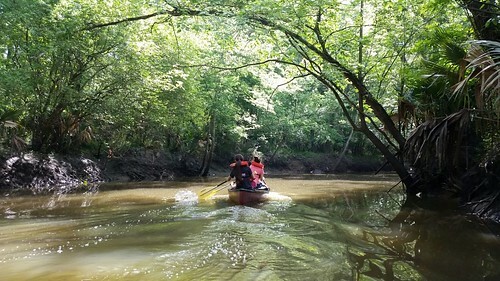 With Easter Monday an off day for several of us, we scheduled a rare weekday paddle trip so they could finally hit the bayou. 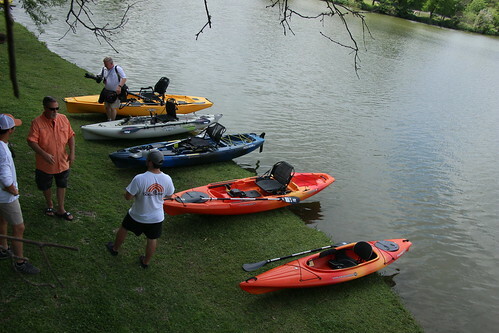 It was a great day for paddling Bayou fountain. The water was low and slow, just covering the third step from the bottom. 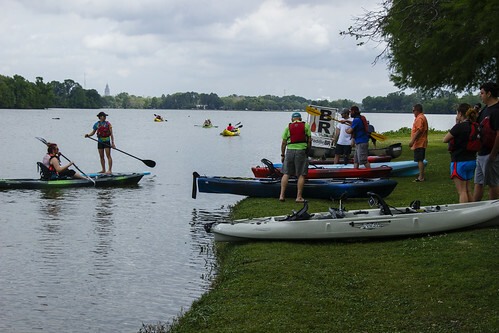 With rain and potential thunderstorms in the forecast, we changed the plan from paddling through to Manchac Park, instead choosing a more flexible out-and-back run. If the sky started looking impending, we could turn back any time. Turning back early apparently wasn’t in the cards. By the time Rachel and I got in our canoe and turned downstream, two of the canoes were way off in the distance and a third already out of sight. We had to book it just to catch up, but eventually all eleven paddlers were back together. We made it all the way to Bayou Manchac before turning back, and I managed to keep up with them the whole way. I wouldn’t say I was grateful for the one small jam I got to clear along the way, but it might just have counted as taking a break. 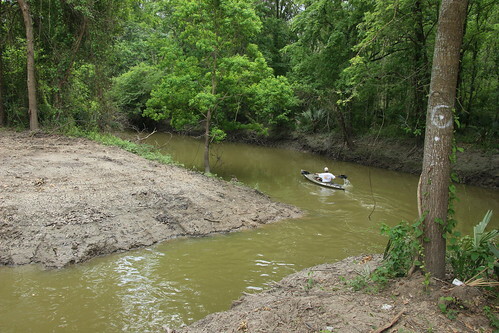 It was a bit easier to keep up on the way back upstream — an advantage of all those long work days, surely — so we got to share more about the bayou and notice a lot more of its inhabitants. We saw various birds, plenty of turtles, the usual fish, and so on. Normally, I don’t point out the cute and docile water snakes that you can see sunning themselves on logs near the banks. This time, however, nobody with a strong aversion to snakes was along, so we did some snake watching and even spotted a particularly content water snake that had recently had a delicious fish dinner. Even my sister (whose aversion to snakes is substantial) thought that one was cool. ← It’s here! It’s here! IT’S HERE!! !